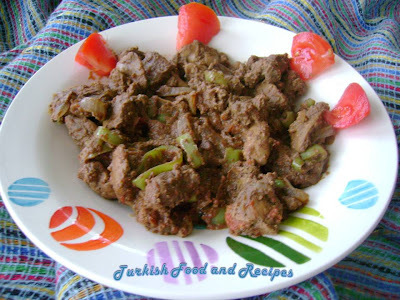 Cut chicken liver into bite sizes and take into a pan. Over medium heat, cook them till they absorb their own juice. Then add salt and canola oil. Cook for a couple of minutes stirring occasionally. Stir in onion and sauté till onions get translucent. After that, stir in pepper and cook for 1-2 minutes. Add tomato and cook for 5-6 minutes stirring occasionally. Sprinkle some black pepper and turn the heat off. Bir tavaya yikanip suyu suzulmus ve dogranmis cigerleri alin. Orta ateste suyunu cekene dek kavurun. Suyunu cekince sivi yag ve tuzu ilave edin. Kisik ateste bir kac dakika cevirin. Sonra sogani ilave edin ve soganlar yumusyana dek soteleyin. Ardindan biberi ilave edip 1-2 dakika daha cevirin. Son olarak domatesi ilave edin ve ara sira karistirarak 5-6 dakika pisirin. Karabiber serpin ve atesi kapatin. the middle is that normal?